The lobby is sumptuous, luxurious, and discreet. You feel very much like a VIP. Even if your children make good use of the frosted mirror in the gilded lobby. Due to its stainless steel refrigeration system, this mirror looks and feels like an ice wall for all to decorate. Paris is no stranger to luxury hotels; it seems like each year there are several new ones on the hot list. 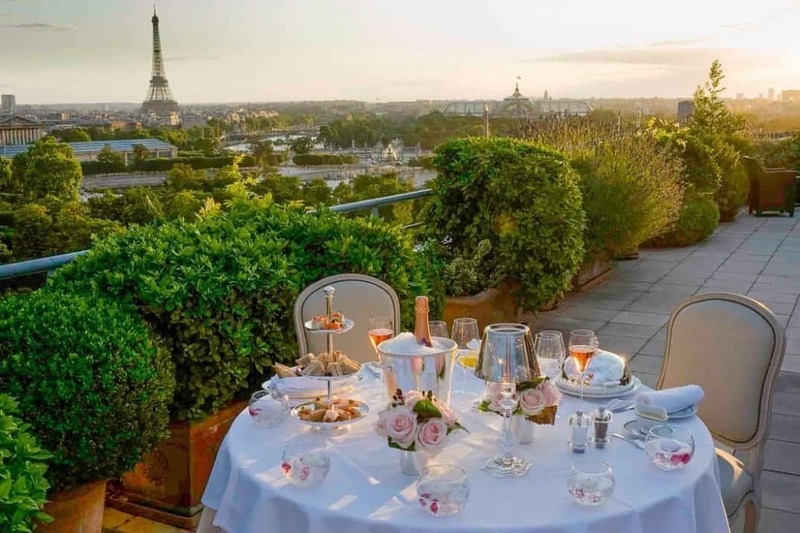 Le Meurice of the Dorchester Collection has not only been recognized by the Condé Nast Gold list, it boasts Forbes Five-Star Awards and has the distinction of being one of sixteen hotels in France awarded Palace Status by the French Ministry of Tourism. So my son was right. It is a palace. And one of the oldest in the city. It’s easy to see why the hotel is frequently referred to as the “Hotel de Rois,” the hotel of kings. ON THE BEST PLACES TO STAY. Everywhere you look, you notice the mosaic floors, the friezes, the paintings, and the gilded accoutrements. 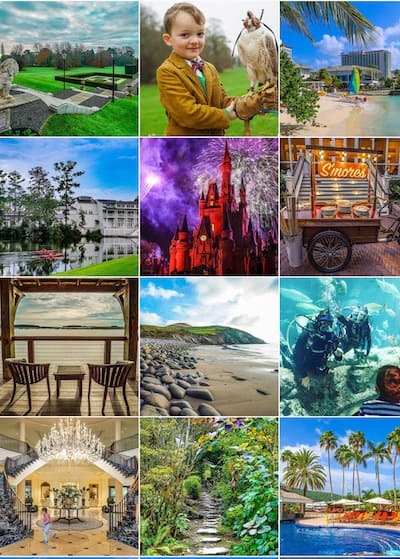 It’s visually breathtaking, and as if it needed more to indulge our eyes, the hotel is filled with a curated and rotating collection of art and antiques from Sotheby’s and Christie’s. ador Dali, who spent one month in residence every year. His behavior was both comical and whimsical; legend has it that he once requested a horse from the hotel concierge. 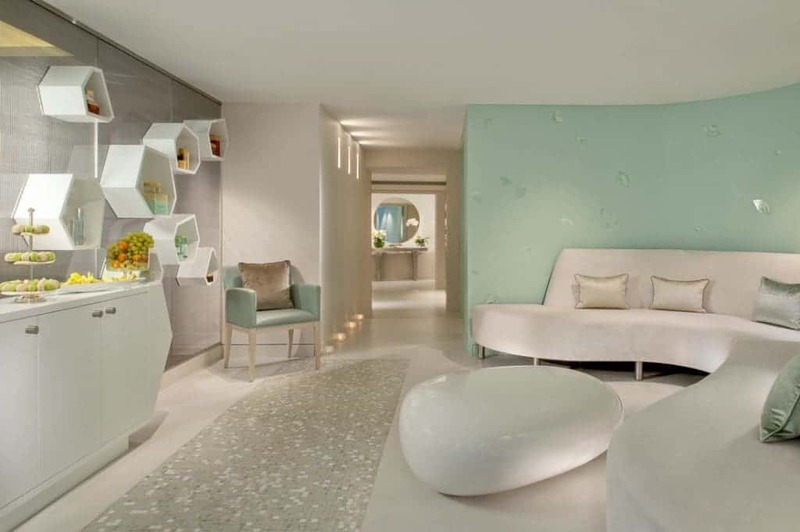 Philippe Starck recently completed a major redesign of some of the public areas and dining areas. Starck pays tribute to him in the restaurant Le Dali by enhancing its whimsical and surrealist atmosphere. 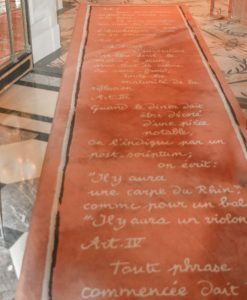 Ara Starck, his daughter, designed a plush 1560 square foot ceiling canvas for the hotel in 2007, and she just complemented it with a new carpet. 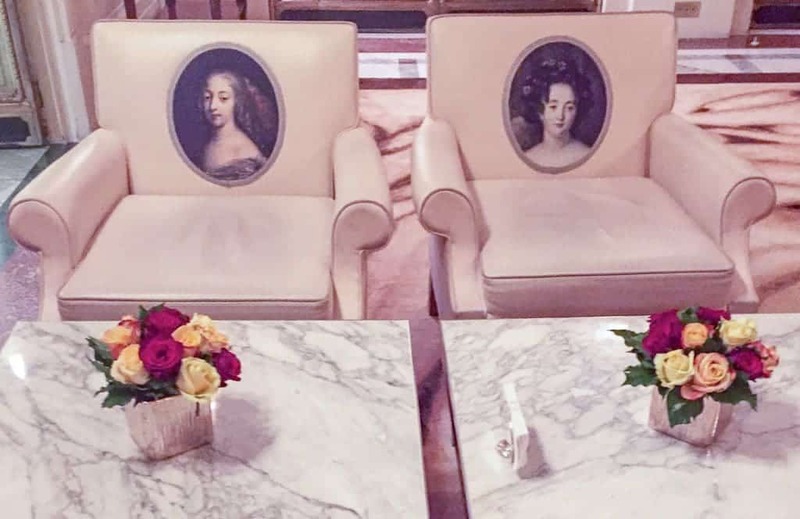 As you walk through the hotels public spaces, it’s easy to picture the elite taking their seats in the Pompadour Gallery off of Bar 228, as their couture frocks cover the royal French portraits Starck placed on each chair. Le Meurice is more than a hotel, it’s a feeling. The hotel frequently hosts aristocracy, royals, and heads of state credited to its refined, discrete nature. So how did we fair as a regular family of four? We were whisked up to our rooms on the fourth floor, and any disappointment of not having a room with a view faded quickly. Both rooms were sumptuous with large chandeliers and every amenity you can think of needing. My children were entranced by their gifts of the Meurice mascot, Pistache, and the abundance of sweets and juice in their room. I love when my children are given toiletries, bathrobes and kids sized slippers; it makes them feel important and happy. 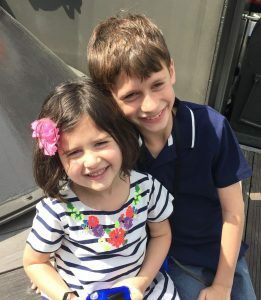 And happy kids make for happy parents! Le Meurice likes children, and we felt this at every point in our stay. 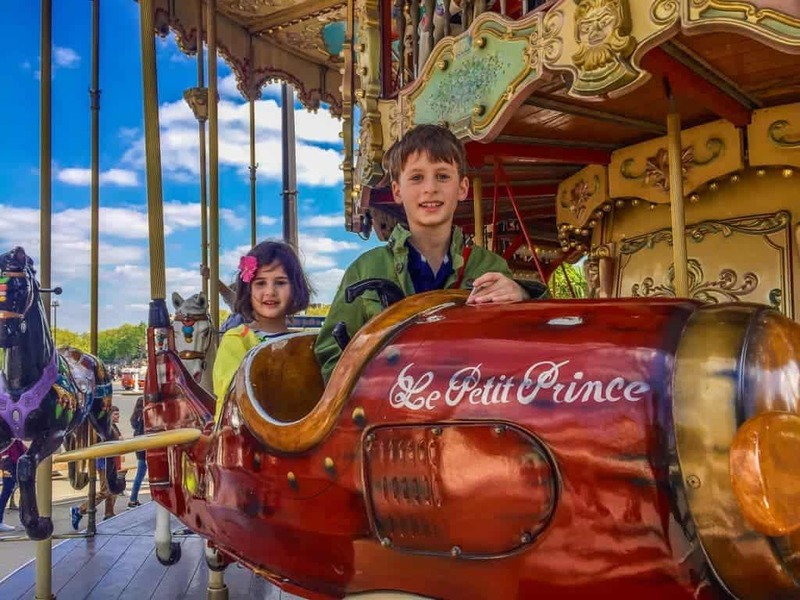 Both big treats like the gifted plush and little things such the hotels’ child passport that lists some of Paris’ secrets and magical sights. My son loved checking off places in his passport! While my children couldn’t yet appreciate the subtle, elegant beauty of their room, they definitely appreciated its size. Our two adjoining rooms were large enough that they could easily entertain themselves with a game of hide and seek while I unpacked. And when we were ready to venture out, I have to admit, I had a spot of trouble finding them. Hôtel Le Meurice occupies an entire city block on the Rue de Rivoli in the First Arrondissement. It truly is the best-located hotel in all of Paris. It’s position across from the Tuileries Garden, between the Louvre and the Place de Concorde makes it extremely easy to get anywhere quickly. I also love being a block away from the Rue Saint-Honoré for an amped up Madison Avenue shopping and browsing experience. Going in Seine on a sunny spring day. We had decided to wander to Île de la Cité for the afternoon to visit Notre Dame, the bird market, and Louis IX’s Sainte-Chapelle. 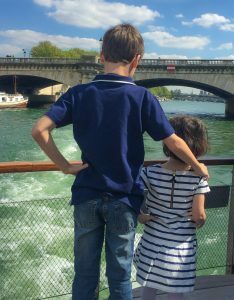 We had wanted to take the children on the Roue de Paris, similar to but smaller than the London Eye. After enquiring about purchasing online tickets with the concierge, we learned that this was not possible. Pas de problème though, the hotel would send someone to wait in line and purchase them for us so we could go at my leisure that afternoon. Fantastique! The concierge at Le Meurice is exceptional and while I would expect nothing less from a hotel of this caliber, they really blew me away here. Jules Verne is popular with many Luxe Recess contributors as a family friendly, foodie meal. We had decided to go to Paris virtually last minute, or at least by Parisian dining reservation standards. 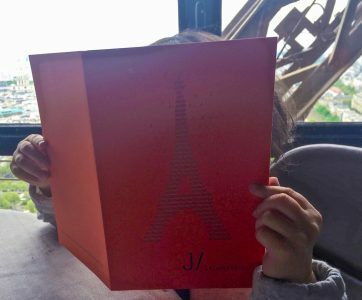 Yet the concierge had no trouble procuring us a window table at the Jules Verne for lunch, or a window table at Les Ombres for dinner. Still not impressed? When I apologized for my stroller squeaking in the lobby, with in a moment, maintenance was summoned with oil for the wheel. Amazing. We’ve had incredible service in our travels, and we were still blown away. 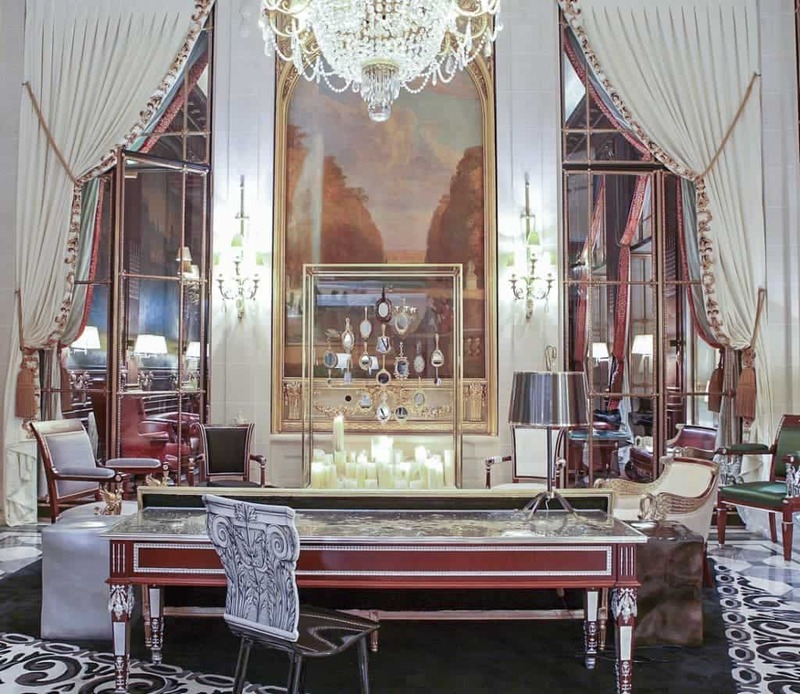 Le Meurice delivers elegant, quiet, thoughtful service throughout the guest experience. Breakfast was served each day in the Restaurant Le Meurice Alain Ducasse. This dining room is so elegant that my husband and I kept looking around in awe and turned a blind eye to the number of croissants my children ate. The room is that stunning. 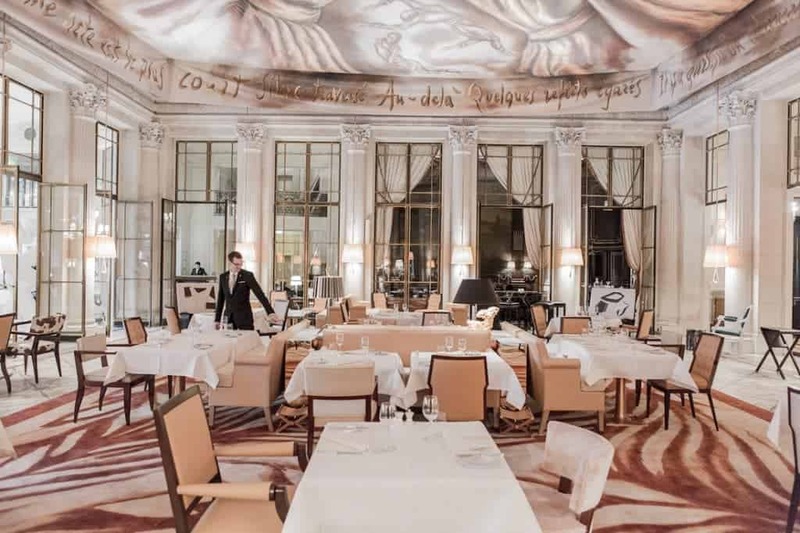 Restaurant Le Meurice Alain Ducasse and the Ara Starck’s ceiling canvas that must be seen. It should come as no surprise that the food was gorgeous as well. Each breakfast started with a bounty of fresh venissoires followed with fresh fruit, yogurt, and omelets. My children were obsessed with the bevy of chocolate choices in their breakfast and one morning my daughter opted for chocolate chaud to drink, a pain au chocolate and a crepe avec chocolate for breakfast. Restaurant Le Meurice Alain Ducasse has won two Michelin stars and is currently led by chef Jocelyn Herland. While we did not experience it this time for dinner, it’s on my must do list for our next stay. Bar 228, best hotel bar ever. Le Meurice is also home to one of my favorite spaces in the world, Bar 228. I am a huge fan of the classic hotel bar, and Bar 228 is one of the reasons I have returned to Le Meurice. 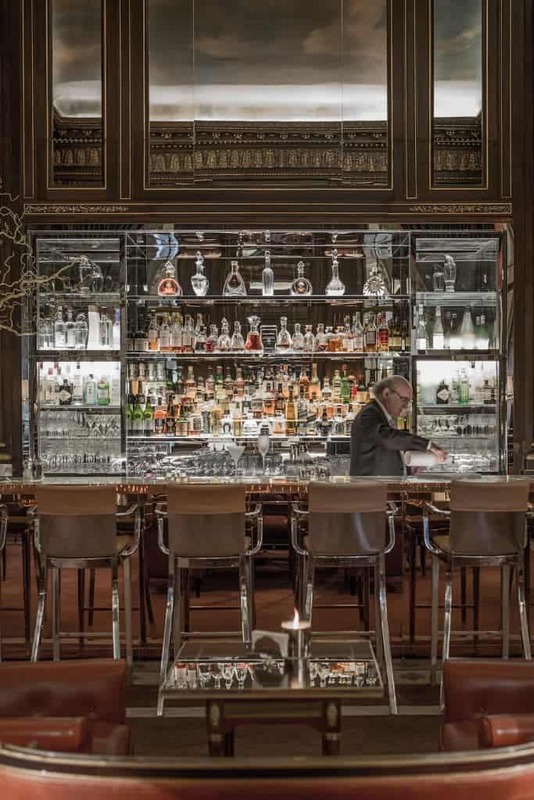 This is not your ordinary hotel bar; this is a masterpiece of refinement. Sitting in this jewel box setting, listening to jazz musicians play quietly while sipping a perfect kir vin blanc is the supreme way to end any Parisian day. The food is, bien sûr, excellent, and a request for something off menu, a steak tartare, was of course met with the now signature “Pas de problème” response. After loving all of our hotel experiences as a family, I decided to take a morning to myself and get a facial at the Spa Valmont. Thanks to the location of the hotel, my husband was able entertain both kids across the street at the playground in the Tuileries Gardens. A win-win for both of us. The spa is exactly what you would expect here, small and luxurious. The treatment rooms are on the 4th floor, and I loved that I did not have to sit around with strangers in my bathrobe waiting for a treatment. My facial was divine, and it concluded with light make-up so I could easily join the family for breakfast immediately after. The spa service was just like every other in the hotel. The spa bill was discreetly waiting for me in the room, along with the earrings I had accidentally forgotten during my treatment. Very rarely have I stayed at a hotel where they think of everything. Here at le Meurice they do. A room service dinner for my children was delivered within 20 minutes along with some extra bon-bons for them to nibble on. My favorite souvenir. It works. Upon glancing at the children’s room service, I noticed that they offered baby food and purees. To someone who once ground up broccoli using a toothbrush for my infant son, this small touch is appreciated. Laundry was delivered back within an hour, wrapped as though it was a present. 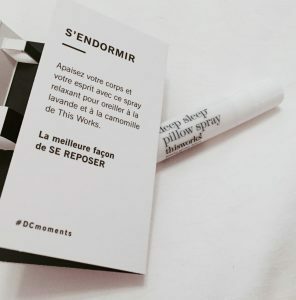 And turn down was delivered with one of my all time favorite products – the This Works Deep Sleep Pillow Spray, an aromatherapy to promote good sleep and leave the bed and pillows fragrant. 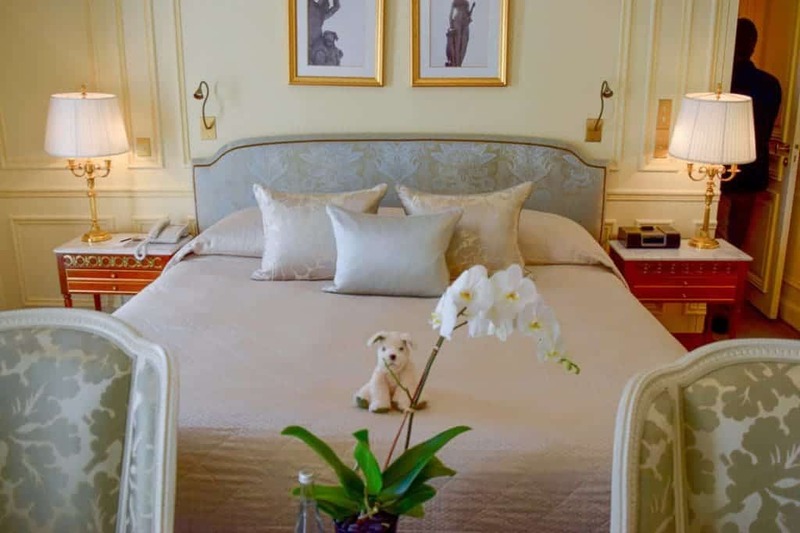 Overall, Le Meurice is about as perfect as it gets for a family city hotel stay. Everything is done seamlessly, quietly, and elegantly. And while my homemade kir vin blancs don’t have the same je ne sais quoi I have the luxury of our vacation memories. We may have checked in as Americans, but we left feeling like French aristocracy. 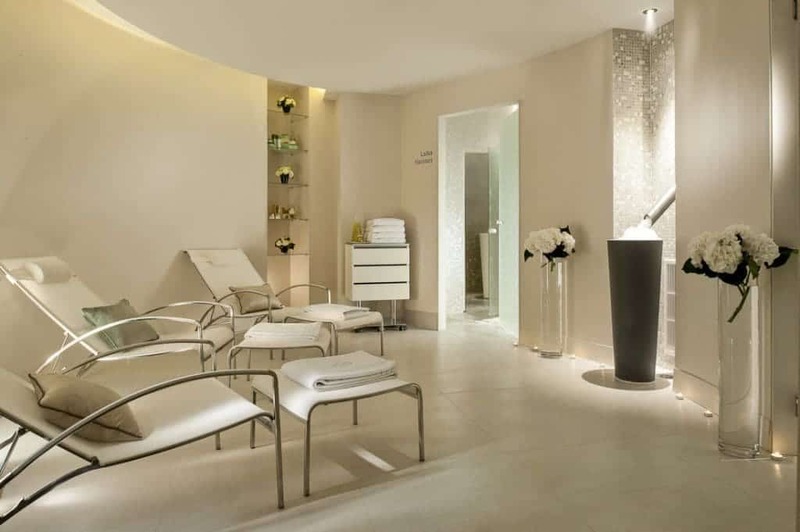 Check your dates for rates at Le Meurice Paris. 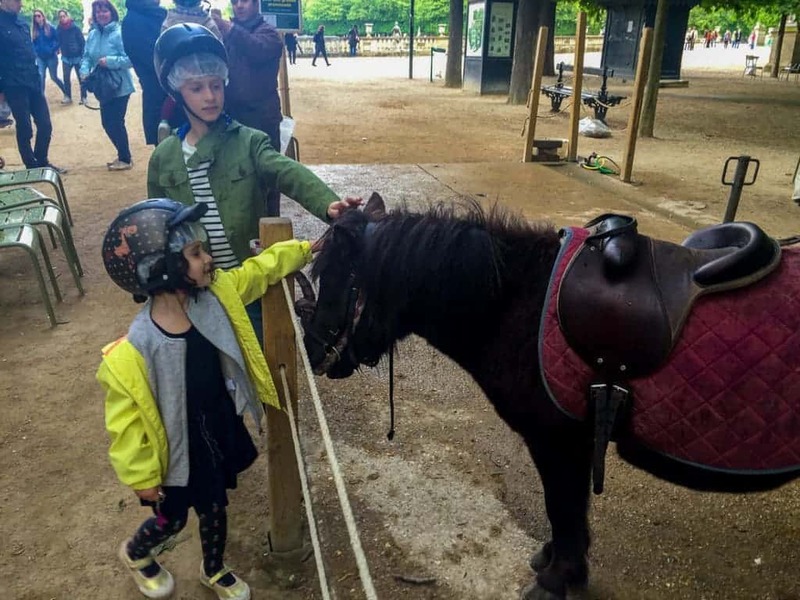 You might enjoy The Hidden Dangers of Paris Playgrounds.